I got a 20 percent salicylic acid peel from my nephew’s mom, a star aesthetician in Northwest Arkansas, while I was at home during Thanksgiving. An extended family of impacted blackheads has taken up residence under my chin for the past six months or so. No amount of topical treatment, facial massage or strong natural masks has been successful at loosening them, and even if they had been, they’re in an awkward place that makes home extraction impossible. Go ahead and Google impacted blackheads. Then you’ll understand my struggle and desperation. So I decided to go to my sweet sister, who I knew would listen to me and get down to it — which meant applying the gentlest of all peels to my face that hadn’t had a peel since my teenage years. And oh yeah, she extracted the hell out of those pesky blackheads. My appointment took place on a Friday night (because who else but a beauty junkie wants to spend her Friday night getting a facial?! ), and my skin completely recovered by the following Wednesday. 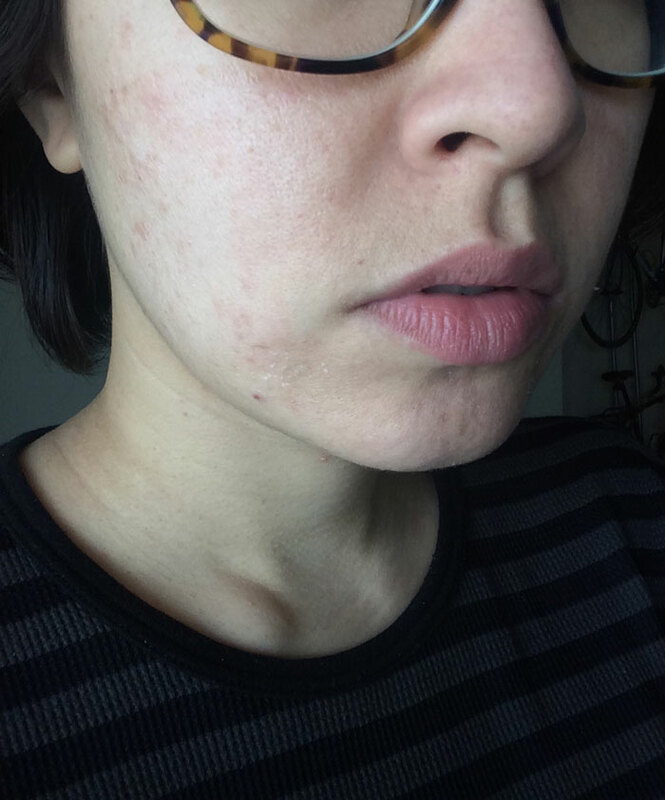 Though this post is not intended to discuss the details of the salicylic acid peel itself, I will say that my skin looked amazing after the healing process was complete, and one month later, I’ve noticed fewer breakouts (though I’m also experimenting with another approach to keeping acne at bay). My family of under-the-chin blackheads is slowly packing its bags and going away, but I’ve still got some issues under there that will require regular treatment and extractions to purge them completely. Here’s how I took care of my skin with natural skincare products after a salicylic acid peel to ensure proper exfoliation, moisture and protection. My typical routine involves double cleansing at night with an oil and a gentle gel cleanser followed by a cream cleanser and konjac sponge in the morning. The only part of this routine that changed was the evening routine. Instead of using my usual gel, I stuck to the same cream cleanser and didn’t have to do much oil cleansing at all because I wore minimal makeup — eyes and lips only, and definitely no foundation! I also stayed away from the konjac sponge (and any excessive exfoliation from wash cloths, towels and skin brushes) until the latter part of my skin’s healing time, when I started to peel a lot more. Then, though, that small but mighty konjac sponge really helped move the exfoliation process along without force or irritation. 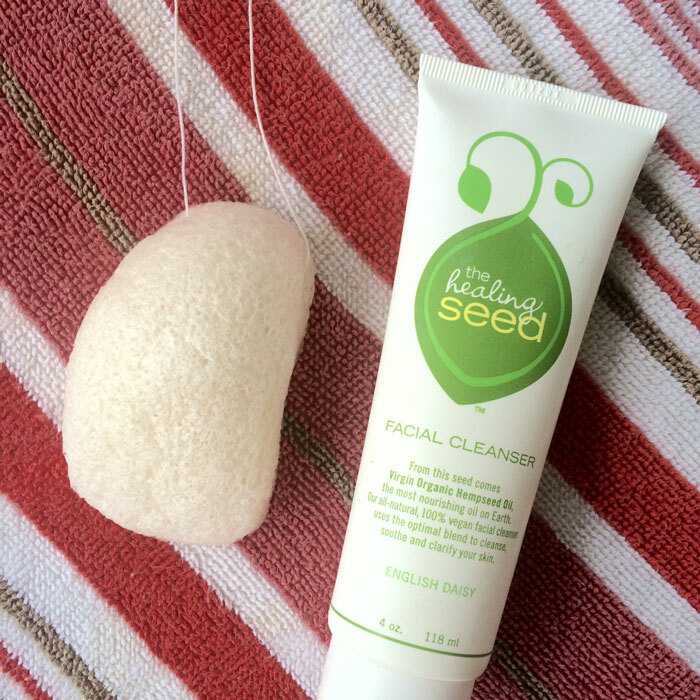 The Healing Seed Facial Cleanser (gifted to me by my friend Gina and now rebranded as “The Wonder Seed”) saved my skin during my recovery. It’s the most gentle cream cleanser I’ve ever used. The runny-yet-creamy cleanser glided over my skin, kissing it better with a concentration of virgin organic hempseed oil, full of essential fatty acids, vitamins, minerals and amino acids. I’ve said it once and I’ll say it again, but hempseed oil is one of the most underrated oils — it’s so intensely moisturizing, and while my naturally oily skin doesn’t need that level of nourishment every day, boy did it come in handy during this trying time. 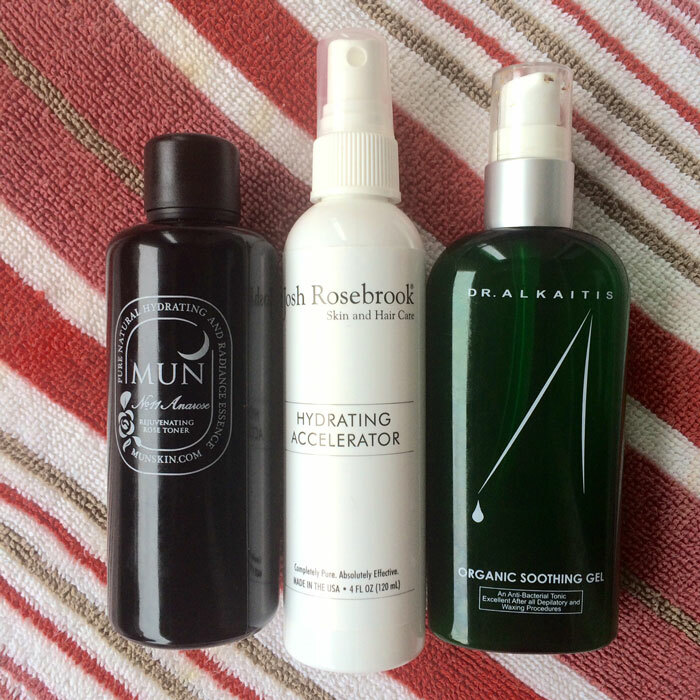 For the first 2-3 days of my five-day recovery, I could not keep from misting my face with Josh Rosebrook Hydrating Accelerator every hour. I will never be without it, as it delivers the perfect spritz of skin-quenching moisture every single time, and this experience sealed the deal for Hydrating Accelerator as a “holy grail” status item. Josh Rosebrook Hydrating Accelerator is chock-full of active antioxidants and herbal nutrients that work hard to relax cell surface tension (believe me, my skin was the definition of “cell surface tension”) and rehydrate my depleted skin. Toward the end of my skin’s recovery — the active peeling stage — I was able to introduce heavier-duty toners that aided in the exfoliation process without forcing skin to peel. After my morning cleanse and small spritz of the Hydrating Accelerator, I would pat in my beloved Dr. Alkaitis Organic Soothing Gel. The base of organic aloe vera gel and organic witch hazel was superb at both soothing and encouraging my skin to exfoliate. In the evenings during the latter part of my recovery, I opted for Mun No. 11 Anarose Rejuvenating Rose Toner, applied onto my skin with a cotton pad, to soothe and gently exfoliate my skin. Both Dr. Alkaitis and Mun take advantage of the healing properties of aloe vera gel, but Mun’s formulation was optimal for an evening tone because of its addition of healing rose hydrosol and acne-preventing willow bark extract (not that I was worried about breaking out after such a deep salicylic acid treatment!). These two toners felt essential during recovery, and the addition of using a cotton pad (which I typically HATE doing with toners) with Mun’s toner gently helped my skin in the exfoliation process. 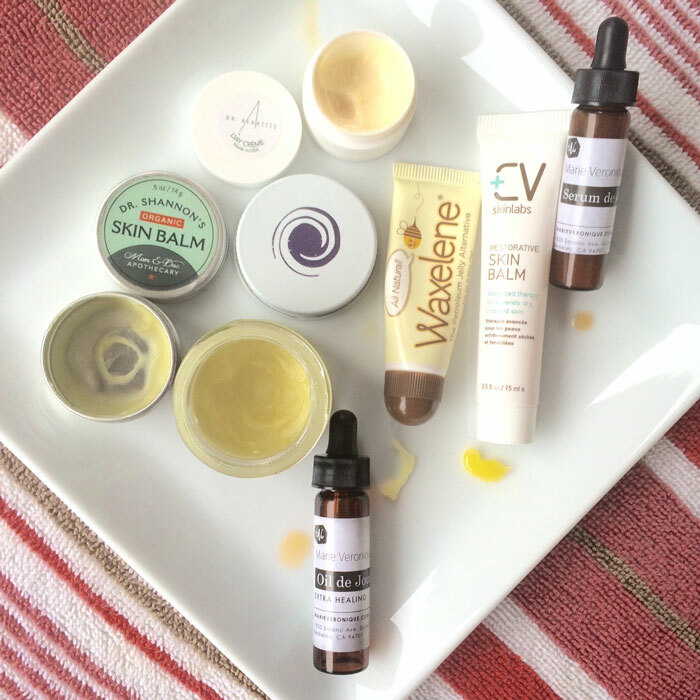 Hands-down the most important part of the overall healing process, treating my skin to nourishing, restorative balms, butters and creams was the key to keeping my recovery process short and somewhat bearable. The first 2-3 days of my recovery were the most excruciating. My skin was tight, uncomfortable and could not drink up enough moisture. Layering products was key. My rotation included Dr. Shannon’s Organic Skin Balm; Elemental Herbs All Good Goop Organic Healing Balm; Waxelene; and CV Skinlabs Restorative Skin Balm. All of these products essentially do the same thing, but I varied it based on the portability of the packaging and what I was doing that day. If I was out running around with my mom, I’d keep Dr. Shannon’s and Waxelene in my bag, as they’re small and discreet, yet pack a mighty moisturizing punch. Dr. Shannon’s Organic Skin Balm is loaded with skin-repairing vitamin E and other luscious ingredients such as sunflower oil, beeswax, coconut oil, pumpkin seed oil, avocado oil, cocoa butter and calendula. Waxelene is more on the simple side, containing just soy oil, beeswax, vitamin E and organic rosemary oil. When I’d apply Waxelene to my lips, I’d get a little extra and dab it into the spots on my face (namely my cheeks and chin) that needed some help. If my hands were a bit parched, I’d scoop out some Dr. Shannon’s, coat my hands and then pat my face with the excess. At home, I’d slather on Elemental Herbs over a thin layer of CV Skinlabs Skin Balm, which was so thick and emollient and nourishing. Was I a shiny mess? Yes. Did I care one bit? Nope. Not in the slightest. These two were miracle workers that helped seal my skin with moisture, allowing me to sleep well without worrying that I’d wake up to cracked skin. But, in addition to these balms, I’d pat in a light layer of Marie Veronique Extra Healing Oil De Jour to get an extra shot of essential fatty acids. I will be the first to admit that this oil doesn’t smell the greatest (because it contains emu oil, which I find a bit pungent), but it’s just so amazing at delivering moisture to the skin in just a few drops that I ignored my nose and focused instead on how my face felt. During the final 2-3 days of my recovery, I was able to go down to just spot-treating my face with the thicker balms and switch over to a light day cream under my usual oils and serums. 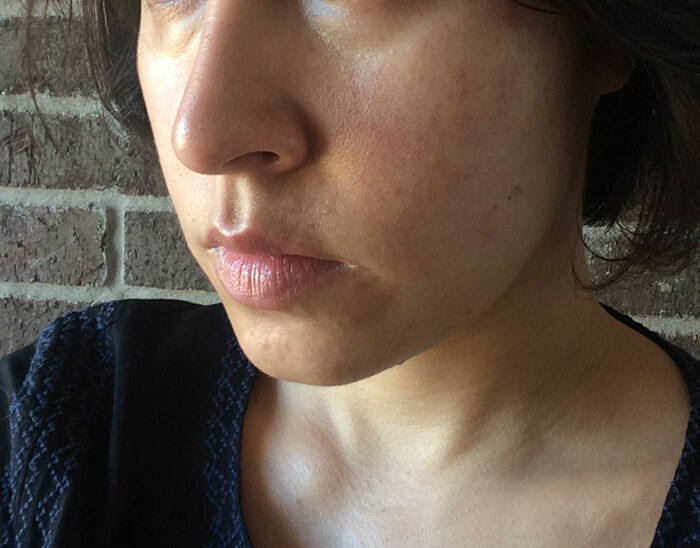 I stuck with Marie Veronique’s Extra Healing Oil De Jour (also available in a vegan option) and mixed it with her Serum De Jour, which provided a bit of SPF (I stayed out of the sun — and public — as much as possible during the healing phase). Serum De Jour has the coveted combination of vitamins C, E and ferulic acid that protects against environmental damage and neutralizes free radicals. Definitely something you want on your face after a strong salicylic acid peel that reveals new skin! Layered over a very thin spread of Dr. Alkaitis Organic Day Cream (yes, even I use creams sometimes), this concoction felt extremely lightweight compared to my balmy days before, yet I knew I was getting enough moisture to keep my skin happy. The day cream, made with a base of whipped shea butter and aloe vera, introduced healing herbs and roots directly to my skin while the oil and serum blend amped up the antioxidant game. It is because of these different product combinations and layering that I truly believe I made it through the aftercare of my salicylic acid peel with relatively few issues. Yes, it was uncomfortable and I felt gross, and no, I don’t think I need a peel like that for a while, but overall, it was only five days. If I ever do it again, though, I will approach it the same way: Peel on Friday, hide away all weekend, take Monday off of work and moisturize like whoa for the last two days while out in public. During this entire experience, I re-affirmed my yearning for a tried-and-true regimen (even if this particular regimen was only for a week) and saw even more proof of how hard natural products work to heal your skin. From this collection of 10+ different natural beauty products, though, I also realized that you have to give your skin what it’s craving. Had I not had this crazy collection of products, I may have missed out on the benefits of various toners and moisturizers. As I attempt to de-clutter my beauty collection and streamline my beauty routine, I’m still rooted in the idea that you may need a few different items from time to time. Do I regularly coat my skin in thick balms? No. Am I hella grateful that I had an amazing supply of them during this experience? Absolutely. Have you ever had a salicylic acid (or other type of chemical peel)? What was your aftercare regimen? Would you get another peel? Tell me in the comments section!